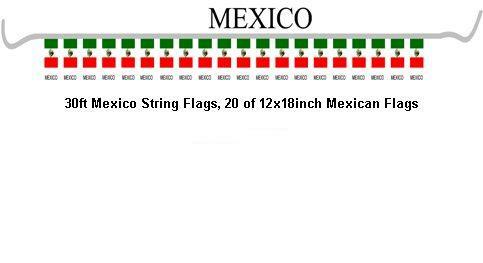 "click to enlarge" A nice selection of string pennant flags including; USA String Flags, International Flag Pennant, Latin Flag Pennant, Mexico String Flags, Auto Dealer String Pennant Flags, etc. 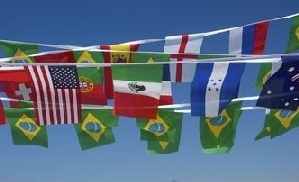 Our string flags offer great quality, each set comes as a string of * 20 - (12" x 18") flags ( 30ft ) in length, and are nicely printed onto polyester fabric in brilliant colors. These pennant string flags are great for classrooms, restaurants, auto dealerships, rallies, parades, political and other special events. and come sewn on ( 30 ft ) canvas header string.
" Great for Teachers, Schools, Restaurants, Hotels, Patios, Lobbies, etc. " 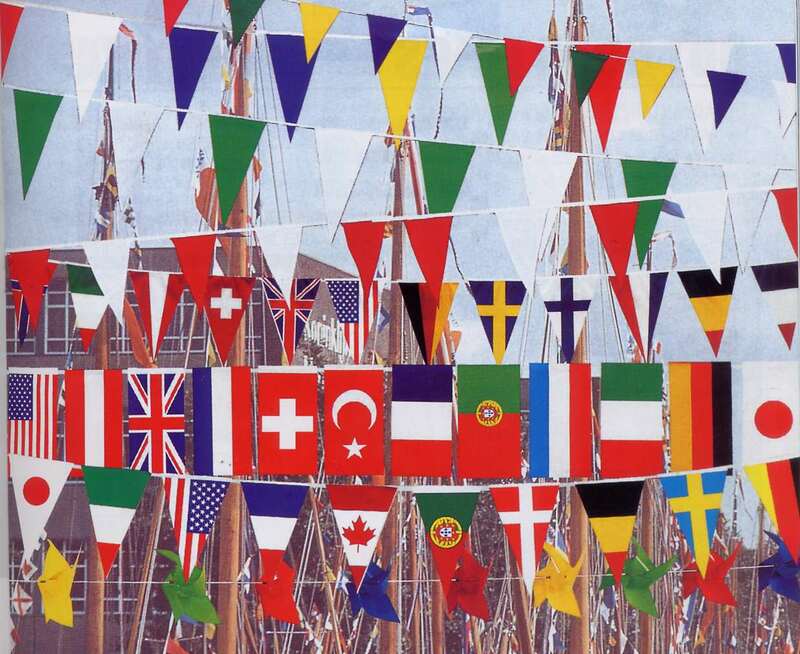 ITEM NO: #String Flag- intn'l- 12" X 18"
* 12" x 18" string flags can be assorted as shown above with any style to obtain quantity price breaks shown.
" Great for Schools, Classrooms, Teacher Aides, etc. " 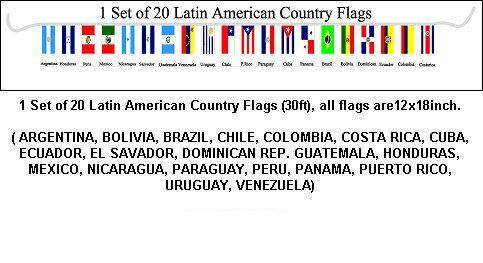 ITEM NO: #String Flag- spanish speaking- 12" X 18"
ITEM NO: #String Flag- latin american- 12" X 18"
and come sewn on ( 60 ft ) canvas header string. 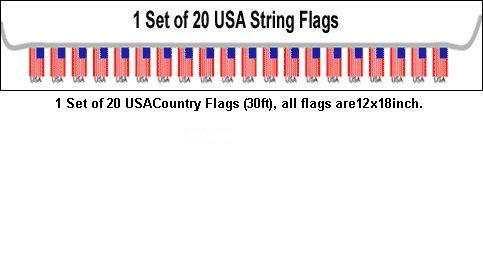 ITEM NO: #String Flag- LG intn'l- 12" X 18"
and come sewn on an approx ( 28 ft ) canvas header string.
" Great for Teachers, Schools, Restaurants, Hotels, Patios, Lobbies, etc. 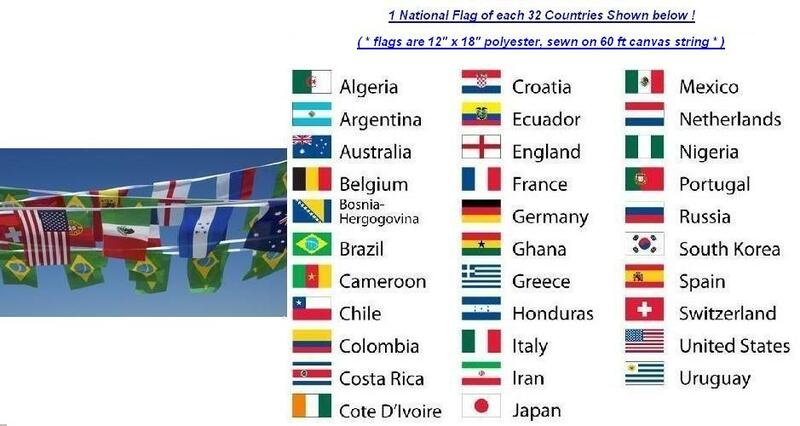 ITEM NO: #String Flag- european- 6" X 9"
ITEM NO: #String Flag- africa- 12" X 18"
ITEM NO: #String Flag- asia- 12" X 18"
ITEM NO: #String Flag- european- 12" X 18"
ITEM NO: #String Flag- caribbean- 12" X 18"
ITEM NO: #String Flag- usa- 12" X 18"
ITEM NO: #String Flag- mexico- 12" X 18"
" Great for Restaurants, Bars, Hotels, Pools, Patios, Lobbies, etc. " ITEM NO: #String Flag- rbow- 12" X 18"